This series of posts will explore the revisions to the Statement of Faith that will appear in the ruling documents of our merged congregation. These new statements reflect a commitment to the doctrine held historically by the church, but they have been written to be relevant and concise. The chart below demonstrates the way we attempted to construct our statement of faith. Everything flows from the nature of God, through the Bible, illuminating for us both our sinfulness and the power of salvation and leading to our mission on earth as the Church of Christ. The first four sections of the Statement of Faith deal with God: God the Father, Jesus Christ God’s Son, God the Spirit and the Divine Nature. We believe God the Father is the Creator, Preserver and Ruler of all things. 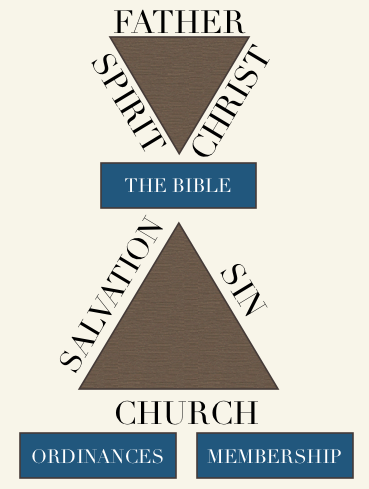 Most Statements of Faith begin with either a statement on the Scriptures or on the Trinity. As the elders considered our beliefs, it occurred to us that the Scriptures themselves speak to a God who transcends them. Not only that, the Scriptures reflect an unfolding of the knowledge of God. At the beginning of the Scriptures, he is and never is not. God is necessary for the Scriptures to exist. We wanted to develop our statement of faith in conformity with the revelation of God within the Scriptures themselves, so we began with God the Father as Creator, Preserver and Ruler. His perfection, his revelation and his redemption of mankind are inherent to everything about his dealings with us. I couldn’t agree more with that philosophy of beginning with God. Certainly, the Scriptures are not God, though they do tell us about God. They point to Him. Without the Scriptures, our knowledge of God would be quite limited (perhaps). But I like to view the Scriptures like John the Baptist (not a perfect analogy, but it works). In John’s Gospel, it says that “he came as a witness, to bear witness about the Light, that all might believe through him. He was not the Light, but came to bear witness about the Light.” (John 1:6-8, ESV). This is very much how the Bible operates. There is a Buddhist proverb which says, “The finger pointing to the moon is not the moon.” This is also a helpful illustration to show us the role of the Bible. It is to point us to a God who transcends and defies all human ideas and description, One with whom we must enter into a covenant and life of oneness to experience in a mystical way. Such a concept is beyond the description of words; but words help to give us indicators of when we enter into this experience. They are ‘pointers.’ They are not THE truth (because the Bible is not a bunch of ideas to adhere to, but is about an experience of God which we can enter), but point to the truth (I don’t deny the Scripture which say, “Your word is truth” or “Your word is a light,” BTW). This is one idea which I feel is missing in the body. I love how Dallas Willard has identified our obsession with the Scriptures as “Bible Deism” – we approach the Bible, but not God, sort of how the Israelites approached Moses, but not God. It would be helpful to take some time to meditate on John 5:38-39. So, this is why I appreciate this approach, Erik. Thanks!